There are many reasons airplane pilots and flight crews depend on aviation meteorologists. At the top of the list are conditions that might down an aircraft, such as severe turbulence, low ceilings or restricted visibility. However, in the winter, aircraft icing is at the very top of the list. When aircraft icing occurs during a flight, the pilot must take immediate action to avoid dangerous consequences. There are two reasons for this: First, because the build-up of ice on flight surfaces changes the shape of the wing — making it less effective by reducing its ability to create lift. Second, the extra weight of the ice causes drag — increasing the aircraft’s stall speed. In the 80s, I served as an aviation meteorologist in the Air Force, where I produced forecasts for our pilots. 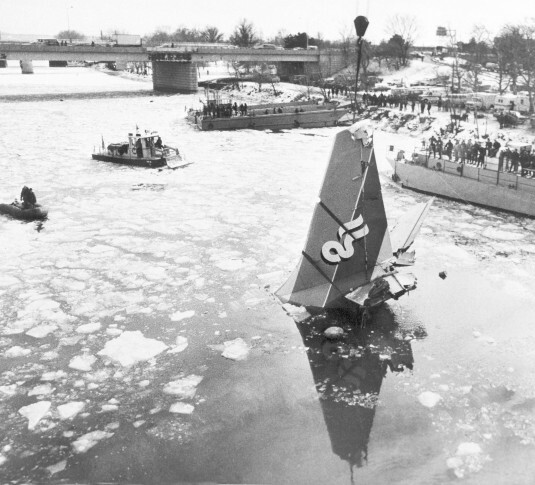 On January 13, 1982 news broke that an Air Florida B-737 had crashed into the Potomac River just two miles from the White House and ten miles from Andrews Air Force Base where I was on duty. The plane had taken off just moments before. Before the plane’s departure, the airport had been closed due to heavy snow. As weather conditions improved, the airport re-opened and the Air Florida flight readied for an afternoon departure. The aircraft was de-iced before waiting for its turn to taxi onto the runway while moderate snow was falling. In the post-crash investigation and analysis, the National Traffic Safety Board (NTSB) cited several factors that contributed to the crash. First, the crew should have used engine anti-ice procedures while on the ground (which are separate from de-icing procedures). Second, the plane should not have taken off with a build-up of snow and ice on the wings. Third, the captain should have rejected the go-ahead to take off when engine readings showed abnormal. But there was also an error attributed to the icing procedure; too much time went by between when the aircraft was de-iced and when the plane took off. By the time the plane attempted to lift off the ground, there was too much ice build-up on the control surfaces, creating drag on the aircraft. It remained airborne for only 30 seconds before striking Washington’s 14th Street Bridge and crashing into the Potomac River. Tragically, only four passengers and one crew member survived the crash, and four people on the bridge were also killed. Several procedural changes related to aircraft de-icing were enacted after the Air Florida crash. These included a reduction of the time between de-icing and takeoff as well as moving de-icing equipment closer to the runway. While de-icing an aircraft will knock ice build-up off wings and landing gear, anti-icing helps to prevent a build-up of ice on an aircraft that has already been de-iced. Anti-icing fluid is sprayed on to prevent water from sticking and can shroud the plane in what looks like a thick cloud of mist. Ultimately, the captain has the final decision on when to takeoff based on communications with air traffic controllers and the de-icing/anti-icing crew. If the maximum time between de-icing and takeoff is exceeded, the pilot may decide to return to the de-icing station. While this may be frustrating for passengers, this should not be considered an over-cautious decision. Many of today’s senior captains were young pilots when the Air Florida crash occurred.